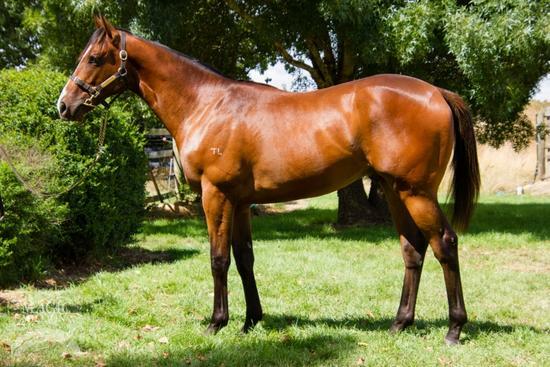 Purchased from the Tasmanian Magic Millions - Lot 56 - Magic Millions and Vobis Eligible!!!! From the family 11-time Group 2 winning mare TICKLE MY. Lot 56 - TAS Magic Millions Toronado Colt - Final PDS from Dalziel Racing on Vimeo. TORONADO (IRE) (Bay 2010-Stud GB 2015, Aust. 2015). Equal Leading 3YO Male on the 2013 WTR (Mile). 6 wins-3 at 2-from 6½f to 1m, £668,356, €102,870, Royal Ascot Queen Anne S., Gr.1, Goodwood Sussex S., Gr.1, Doncaster Champagne S., Gr.2, Newmarket Craven S., Gr.3, Ascot Winkfield S., L, 2d Goodwood Sussex S., Gr.1. Out of a half-sister to SW Casamento (Doncaster Racing Post Trophy, Gr.1). Sire of Yolo Again, Baylagan, Tularka and of the placegetters El Ingrato, Illusions, Topical, Torque Power, Triple One, Tronada, etc. His oldest Aust.-bred progeny are yearlings. Cranbrook (g. by Master of Design). 3 wins to 1200m to 2017-18, TTC Mud Bar & Restaurant H., 3d TTC Cressy Cricket Club H., Dolly's Dream Foundation H.
Snitz. 5 wins-1 at 2-to 1400m, A$263,575, to 2017-18, BRC Canadian Club H., Herron Todd White H., QScan Radiology Clinics H., Clarence River JC NRRA Country Championship Qualifier, 2d BRC Doomben Cup Raceday 2YO H., VCV Brisbane H., 3d BRC Makers Mark P., Kiss & Make Up Aquis Farm 2YO H.
My Thriller. 3 wins from 1200m to 1600m, TRC The Tank Memorial H., 2d TTC St Andrews H., 3d MRC (Mornington) Le Pine Funerals H., TRC Hobart Cup Raceday H., Fuji Xerox Tasmania H.
Teriki. 7 wins-1 at 2-to 1200m, A$122,499, to 2017-18, TRC Kevin Sharkie H., Devonport RC Simons Design Centre H., TRC Lark Distillery H., TTC Fish 'n' Chips at Seaport H., Premium Events Catering H., 2d TRC PFD Food Services Autumn H., Wolf Blass Autumn H., Devonport RC Simons Design Centre H., TRC Hazell Brothers H., TTC Legal Solutions H., 3d TRC Lady Lynette S., Raine & Horne Autumn H., TTC Magic Millions 3YO H., TRC Lyden Builders H.
Gallow Gate. 8 wins from 1200m to 2100m, A$113,050, to 2017-18, TTC JG Pest Control 10 Years P., Dolly's Dream H., Foot and Playsted H., Relay for Life H., Electro Rewinds H., Brooklyn Park H., Samios H., Neil Buckby Motors H., 2d TTC Brisbane St News & Lotto H., Luxbet H., Ken Evans Memorial P., 3d TTC Carrick P.
PEARL PRINCE (Rare Pearl). 14 wins-1 at 2-from 1200m to 1600m, A$498,065, MVRC Bill Stutt S., Gr.2, Strathayr H., Gillies Homestyle Pastry H., Cosmopolitan H., 2d MVRC John F Feehan S., Gr.2, SAJC HIH Insurance Classic H., L, 3d SAJC City of Adelaide H., L, VATC Lord S., L.